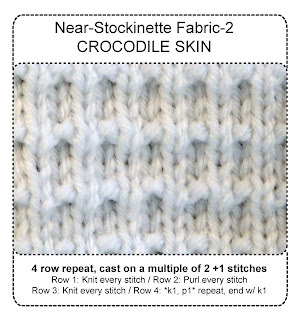 TECHknitting: Uneven knitting, part 1: stockinette fabric--how to tame "rowing out"
Uneven knitting, part 1: stockinette fabric--how to tame "rowing out"
The human eye is great at seeing even the most subtle patterns, and for good reason--for much of human history, survival depended on knowing whether that shadow might be ... a tiger in the long grass, looking for dinner! For knitters, this means the eye immediately seeks out patterns in knitted fabric--an advantage if your sweater features lovely cables. 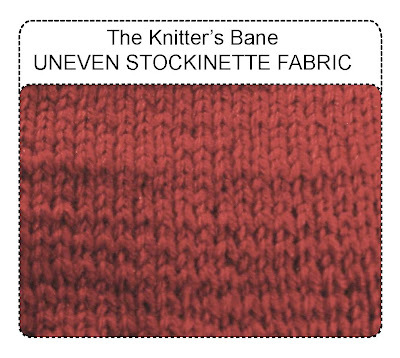 But the eye's ability to pick out patterns is a disadvantage if your sweater features the Knitter's Bane: the "rowing out" of uneven stockinette fabric. Stockinette fabric is typically made by knitting across the front and purling back. If you knit at a different tension than you purl (a VERY common problem) your fabric develops those tiger stripes the eye is so well-suited to detect. The looser row (for most knitters, the purl row; but for some knitters, the knit row) pouches out and distracts. Below is a three-part post attacking this problem. Part 1 lays out some traditional tricks. Part 2 shows some limitations on these tricks. Part 3 lays out a final trick--a maybe new way of thinking about the problem. Many, many tricks have been developed over the years to counteract the problem of uneven stockinette fabric. The four traditional tricks I've found best are laid out below. The easiest cure for uneven stockinette fabric is never purling. There are two ways to accomplish this: garter stitch fabric, and fabric made by circular knitting. In garter stitch fabric, there is only knitting back and forth. There is no purling. Similarly, in circular knitting, stockinette fabric is not made by knitting there and purling back. Instead, it is made by knitting endlessly, round and round. Accordingly, for garter stitch fabric, and for circular knit fabric, it matters not at all that your knitting differs from your purling. There simply isn't any purling. Many clever designs exist for garter stitch garments, especially those created by the late, great Elizabeth Zimmerman. As to circular knitting, many things can be made in the round--hats, sweaters, socks, even square flat things like blankets and shawls can be made without purling by working in the round if they are started from the center and worked on circular needles. A more challenging solution to differently tensioned knit and purl is to teach your hands to tighten up what's loose, or loosen up what's tight. To work this, you first have to figure out which way is looser, knit or purl. Here's how: make some fabric, ending on a knit row, and leave the fabric on the needle. Lay the fabric on a table, knit side up. Dim the overhead lights, and slant the beam from an adjustable table lamp or flashlight to throw your fabric into relief. You know that the row on the needle was made by knit. The row below that was made by purl, the row below that (2 from the needle) by knit, and so forth. Find the looser rows, and count down from the needle to figure out how they were made--by knit or by purl. Now you're set to mess around--to experiment. Can you increase the tension on what's looser? Is it easier to loosen the tension on what's tighter? Rome wasn't built in a day, and neither did you learn to tension your yarn in a day. Change takes time and attention. Plan to make a scarf. That'll give you plenty of length to fool with tightness and looseness, and you'll be able to see your results as the scarf gets longer. In the best-case scenario, the scarf ends smooth and even, and the problem is solved. This trick is really an extension of the second. If your hands stubbornly resist your brain, if they continue to churn out stripy fabric no matter what you tell them, the next thing to try is tricking those hands into submission. Your experiment with the beam of light already revealed which technique is looser--knit or purl. For this trick, arm yourself with a needle of a smaller size, then do the looser technique with that. In other words, if you are working with a pair of size 6 needles, and your purling is looser than your knitting, take a size 5 needle to purl, and keep the size 6 to knit. Remember--it is immaterial what size needle holds the stitches to be knit, the finished stitch is determined ONLY by the needle making the stitch--the right needle. This trick lets you create the looser stitches around a smaller needle, making the looser stitches smaller, and therefore tighter. It might take time to figure out this trick--your scarf might be quite long indeed by the end of the experiment. Also, I know knitters who must use needles TWO sizes apart to tighten up the loose technique, so if at first your fabric remains stripy, try, try again. BTW: if you're making stockinette fabric by working back and forth on circular needles, you can work this trick by screwing two different size points on each end of the cable from an interchangeable tip kit. Novelty yarn is generally thick and thin and every which way. Who cares if the purl and the knit are different? Frankly, with most novelty yarn, its hard to tell if it was made by knitting or purling at all--garter stitch is the more usual method of creating a novelty yarn fabric. Handspun yarn is also commonly available spun "thick and thin." Variegated yarns (some of which are beautifully hand dyed) and tweed yarns both help hide undesirable fabric stripes with a randomly varying color pattern--the eye is fooled away from the uneven fabric surface by the undulating colors. Garter stitch: Avoiding purling altogther can become tiresome. Garter stitch is bulky and slow to knit-- it takes a great deal more yarn to make the same length of fabric in garter stitch than in stockinette. Also, garter stitch is not suited to sleek fashions. A garter-stitch T-shirt or halter-top might be a bit odd. As to circular knitting: at some point, perhaps the short rows back-and-forth across the back of a sweater neck or a sleeve cap, that old purling is going to rear its head. Then where are you? As to changing your tension: If you can train your hands, this IS the best solution. Yet, experience shows that, for many knitters, when you're tired, or when you're knitting on autopilot, the hands may stubbornly revert. The different size needle trick might work for you--it works for many--but when you want to knit with a new yarn, the relationships between the needle sizes might change--you might need two sizes smaller instead of one, you might need one size smaller instead of two. To succeed as a two-different-size-needle-knitter, you're going to have to be extremely serious about swatching each time you try out a new yarn. If this is you, great, problem solved. But, hmm...well... many knitters aren't really THAT serious about swatching. And as for the last trick--using wild yarns, well... just as there is a limit to the number of garter stitch garments one wardrobe can absorb, so you may find that there is also a limit to the number of novelty tops, rustic handpun garments and tweed or varigated sweaters. Near-stockinette fabrics are those which can substitute for stockinette fabric with no alteration to the garment pattern. Near-stockinette fabrics feature a subtle surface pattern of purling on the "knit" side. Hunt through a pattern stitch book--ideal is a small all-over pattern. These surface patterns work two ways: first, the pattern itself interrupts the stripe, and second, the pattern disguises any remaining stripy-ness by inserting another, more pleasing pattern. For substitution into a stockinette fabric garment, the near-stockinette fabric you choose should not alter the structural properties of the fabric. However, it turns out that stockinette can take quite a bit of alteration and not lose its basic properties --the stitch to row ratio, the tendency to curl, the direction of that curl, the weight, hand (drape) and bulk of the fabric. 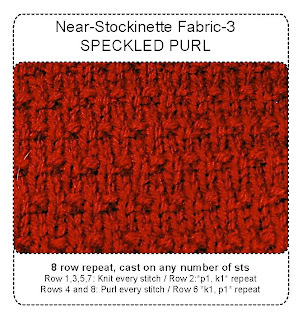 Another limitation on near-stockinette fabrics is to choose one which doesn't interfere with your garment shaping. 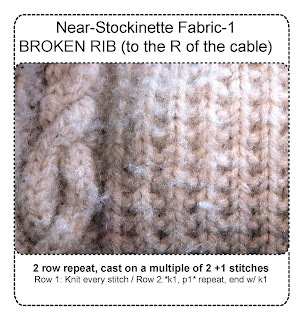 Carrying up a line of knit stitches in a broken ribbing pattern is a lovely substitution for reverse stockinette in an aran sweater (see illustration of broken rib) but it can make decreasing for a set-in armhole challenging. A less linear, less insistent pattern, like crocodile skin or speckled purl would not raise that issue. Don't conclude that the stitch patterns shown here are all you have to choose from--these three patterns are my particular "old standbys" for near-stockinette fabrics, but there are many, many others to choose from. Uneven Knitting, part 2: Bunching, big stitches and lumpy fabric--the problem of too-long runs. Chain selvedge a.k.a. "slipped selvedge"